One of the truly unfortunate things about an All-Star Game in Orlando was how decentralized the festivities were. Every Point A to Point B was bound to be a 20-minute trip and a $30 to $40 cab ride, depending on how much road rage your cab driver had. 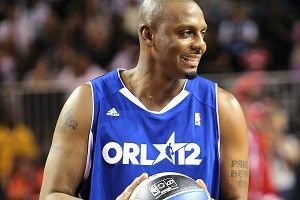 So on Sunday evening, a few hours before the All-Star Game, when Anfernee “Penny” Hardaway offered to talk with me and drive me back to the hotel, there was just no way I could say no. Being here for two days now, I feel like you are sort of the grand marshall of NBA All-Star Weekend in Orlando. You’re back, Shaq’s around, Dennis Scott is here. How does it make you feel to be here, getting so much love? It took me back to the old times, especially when the three of us did the interview for TNT in the barbershop. It was a throwback to the days when we were playing together and the glory days of the Magic. I grew up, by geographical force, a Hawks fan, but one of the interesting things about that Magic team was that it seemed to attract fans from all over the country, myself included. To this day, I feel like that team has semi-cult status, almost like the Fab Five. Would you agree with that? Yeah, I definitely do. One through five, we were stacked. We were a championship team, if we had stayed together longer. Hindsight is 20/20, but I think we would have won one championship at least, because we were on our way. We were there. You know [laugh], after Shaq left it was over, but at that time our five was as good as any five. So beyond basketball, one of the things people immediately associate you with was your massive Nike-Lil Penny ad campaign. One thing I feel people don’t understand was how cross-cultural the campaign was. I vividly remember the Lil Penny’s Super Bowl party commercial, because to this day, I don’t think a commercial has had that many unbelievable cameos. How was that, for a young star, with all of those people essentially there for you, from Tyra Banks to Stevie Wonder to Tiger Woods? It was very humbling for me. I’m not a very outgoing person, I’m pretty shy and laid-back, so to see these stars turn out for my commercial, it was definitely a breakthrough for me, because I knew this campaign was history-making. I can always go back and watch that commercial and reminisce on all the big-name athletes and celebrities that were involved. Recently, I saw Nike shoot their new Kobe commercial, with all the celebrities in the crowd. Yeah, it reminded me of mine in a sense — kind of close — but yeah. Just being a young kid, it was exciting. I also think you can attribute some of the later successes for people like Chris Rock and Spike Lee and Tyra to the popularity that arose from these various ads. Seemed like a career-altering thing for not only you, but other people involved. Yeah, I mean, I was a pretty good basketball player at the time and people knew me for that, but the Lil Penny commercials opened me up to a completely new audience. It definitely thrust my career to another level, same with Chris Rock, because once everyone knew who he was as the voice, he became even more popular. So reading other interviews with you from present day or the recent past, I noticed most conversations with you seem to not go past inquiries beyond 1999. Obviously, the height of your stardom during that time period is an extremely interesting thing to talk about, but one thing I’m interested in, as well as others from my generation, is what’s been up since your playing days ended. When your career was over, did you have a game plan? Well, my main concern was going back to Memphis and making a difference in my community. I knew that was what I really wanted to do and I knew the city needed me to be there. There’s a huge demand on my time, to give money to different charitable organizations and to just be a presence, and once I knew that my career was ending I knew I wanted to go back and do something big. How do you feel about the idea of “owing it” to the place you come from? Do you feel like players coming up now have that same belief system of giving back like you do? I can’t really speak for anyone else, but for me, because of the love that Memphis has shown, I knew I had to go back and not only give money but give my time. I think — I can only assume — but I think a lot of guys from my era felt like their cities were the reason why they were who they were. They pushed them, they supported them. A lot of guys just do it because they have the money. They do it because “I guess I’m supposed to.” There are so many ways to do it, but the time is the thing. It’s good for the kids to see you, because you were once in their shoes. And once you’re there, you have to convince them that you really care, because they trust you with all their heart. The thing is, they’re used to people leaving them. A lot of the kids come from single-parent homes, you know, and especially in the inner city, they want someone, especially a male figure if they don’t have that father figure at home, so when you come around there talking, you’re going to have to talk it and show it. Preaching to the choir. I completely agree. So since you got back to Memphis, what would you say have been your proudest accomplishments? I’d say giving a million dollars to the University of Memphis, because I went to that institution and it helped thrust me into a better situation and helped me get to the NBA. I didn’t really have to go to college, I feel like I could have gone right out of high school, but to go and learn for three years about how to be a man and how to own up to responsibility and how to work with others was important. I learned a lot, so giving money back made me really feel proud to do something for them. And they built the Hall of Fame in my name. Other things I’ve been proud of have been giving money to the St. Jude [Children’s] Research Hospital, giving money to the Make-A-Wish Foundation, just continuing to give to the community that made me who I am. Getting back to basketball for a second, when Dwight Howard came out and said he thinks your jersey should be retired, that had to be a great feeling. It felt great, because when you think about the Magic, you think about me and Shaq. Still. You know, Dwight Howard is the man and it’s his team, but the history of the game and how we put it on the map with first Shaq and then me coming behind him, you have to recognize the history. I thanked him for saying that because he didn’t have to. Dwight is a really intelligent guy, just to get to know him better has been great. He was in my league in high school. Ha, he wasn’t as good then, was he? He was awkward and tall and would still get 35. So you’ve had kind of this reverse post-career renaissance, in the sense that most retired athletes try to stay in the spotlight as long as they can, be in commentating or what not, but you went away for a decade and are gradually starting to creep back into the limelight. Now that there has been a weekend like this with a lot of shine, being surrounded by so many of your older cohort, does it make you want to take a stab at staying in the spotlight? Where’s your head now? Well, right now I think I have a really good relationship with TNT, that’s what I just left the arena doing, and in the near future I think I’ll be doing more. For different events in the future, I think they’ll call me, so that will continue to put me out there. I mean, this weekend is almost an All-Star Game in itself for the commentators, because they’re being thrust out there, they’re being branded again into superstars. So yeah, I think that’s where I want to be. What other projects are you working on? I get the sense you’ve got a lot going on. the TWITTER. You know, just trying to pump up my Twitter page. Oh yeah, and I’m an executive producer of the Bottom Line Sports Show. I’m on every Tuesday and Thursday with Gerald Brown, and sometimes Mateen Cleaves and Charles Oakley. We have a great time. The list of people we’ve had on, I think we’ve had nine Hall of Famers that have been on, so yeah, it’s getting pretty big. Last question, and I was set on keeping this until the very end because I didn’t want it to dominate our discussion, but were you surprised by the explosion of press over you wearing the Galaxy Foamposites in the Celebrity Game this weekend? I was. But there are a lot of sneakerheads out there. I mean, that’s what’s overtaken the country right now. The hottest sneaker is like the thing nowadays. It’s taken over. People don’t buy records anymore. They buy shoes. Yeah, right? I know, so sneakers have taken over. And I was shocked by how well the Foams have taken off, especially the Galaxies.